On Friday, Dec. 4, 2015, the German parliament, the Bundestag, with a great majority approved the federal governments plan to go at war with Syria, labelling this war a “fight against DAESH” in “self-defense”. I will come to this in a minute. The Bundestag approved a bill by the government to send Tornado-jets to Syria and a warship to the mediterranian sea and a total number of 1,200 soldiers on top. Now, the German long-time chancellor Angela Merkel is being allowed to start her war – just in time before Christmas. As a faithful Christian, she might be a little too ignorant for catching the irony.. Deployment of approximatly 1,200 “quick reaction force” soldiers, which are said to be engaged as servicemen – but this could be changed quickly, therefore it seems to be just a facade argument. From these few and frugal info, some first questions of a rather technical nature do appear. The Tornado jets are said to provide surveillance info, only. That sounds inoffensive, doesn’t it? If this “surveillance”-mission was that inoffensive, why will the jets be armed with sophisticated AIR-TO-AIR-MISSILES? Does DAESH, the so-called target, have an own airforce (apart from Turkish, Israeli, Australian, Canadian, British and US-airforces) to be a threat for the German planes? Air-to-air misiles are designed to take out enemy planes IN THE AIR..Arming survaillance-jets with such air-to-air-missiles directly hints to the Russian and Syrian airforce as possible targets: as Germany is joing the anti-Syrian “coalition”, the frontline is pretty clear. Since when does France need a German warship for guidance and protection of the French aircraft-carrier? Or did any of the entities supporting DAESH threaten to sink that bowl? Maybe whe should ask ErDOGan on this issue. Is this just designed to “fight” DAESH? What do you think? The official statements say that Germany needs to take “responsibility”. “Responsibility” is the Orwellian newspeak for: bomb, attack, invade, occupy, kill, genocide, plunder, devastate sovereign nations under the pretext of some staged reason or a simple lie. The same responsibility killed at least 80.0000 Afghans. The same “responsibility” was killing more than 2000 civilians in Yugoslavia in 1999. The very same “responsibility” is now helping France to kill civilians in Mali, labelled as “terrorists”. Isn’t it just a stunning coincidence that in all NATO-styled wars the number of civilians being killed by the western “democracy”-exporters is incredibly higher (up to 90%) than the number of soldiers or militias? Well, regarding the death ratio of 90% civilians, a sane mind presumably would name that a genocide. Anyway, everyone recognizing the constant and increased threats of USA, EU, NATO against Russia and China, the ongoing destabilization of the oil-rich regions of the so-called “strategical ellipse” (based on MacKinder’s “heartland”-theory, published in 1904), will probably understand that Germany will not just send in some old jets with cameras to spot the targets and a frigate to pamper the French feelings of greatness. It is highly possible, if not logical, that this “war on ISIS”, as the spokeswoman of the federal government did name the operation, is just the first step into a full-scale war on Syria. It is no coincidence, that some literate German publishers, politicians and military already spoke of a long time war, with a suggested duration of 3, 10 or even up to 30 years. Do you really think, the German government would engage in an all-out “war” or “mission” against a terroristic organisation Germany itself helped to empower? Would you kill your investments? Now, let us come to the very interesting argument of “self-defense” (according to UN-Charter, article 51 and EU-Treaty, article 42, 7). This “self-defense” is made up as a reason for bombing DAESH, Syria, or whatever (as long as bombs are being dropped and the industry creates profit). The German government enjoyed to argue that the Paris terror attacks on Friday, Nov. 13 would need to be responded to properly – by bombing DAESH in Syria. The German government obviously missed the point that NONE of the attackers were Syrians but French and Belgian citizens. Adopting the logics of the French and German government, Germany and France now must bomb France and Belgium in “retaliation” – and the creators of terror, the USA (Washington DC), Saudi-Arabia (Riyadh), Turkey (Ankara) and Qatar (Doha) as well. GPS-data for all targets can be provided by Google. No need for “surveillance”. The German government does know that their arguments are nothing else than dust. Hence, they were keen to switch the historical facts from the feet to the head, stating it was Syria where DAESH had been created (maybe it was Assad?) and then attacked Iraq – a really insane, infamous and insulting lie. The German government does very well know, and so does every member of parliament, that its bill to approve the military step in Syria is based not only on the blatant violation of basic principles of international law but also on horrendous lies. Only one of the MP’s did refer to this…. Does the Bundestag replace the UN? Neither Germany nor the other western nations, especially USA, UK, France who are members of the United Nations Security Council (UNSC), did request an approval for the use of force by the UNSC. Guess why? The USA, UK, France would have been punched by Russia and China. Thus, as the legitimate way is being cut, the terrorists in the western capitals decided to take the direct way of aggression, just frugally coverd by staged approvals of the national parliaments. The German members of parliament had – take a seat! – 2 days to read the bill given by the government and to make up a mind about it. This is pretty short time, and it appears that it was the goal to just push this bill through the house and prevent anyone from thoroughly checking the text and maybe gaining external expertise for making a decision. Thinking unwanted. The approval by the Bundestag is based on no law. This decision opens the gate for illegal warfare – which is prohibited by the German constitution. According to international law, the German step into the “coalition” war against Syria, Syrian civilians and Syrian infrastructure is illegal. The UN-Charter strictly prohibits the meddling of external powers into internal issues of sovereign nations. But the German government itself delivers the reason to critizise her. It was the German defense minister, whom we have to call warfare-minister, Mrs. Ursula von der Leyen, who presented the unlawfulness to the public: “This is no war”, she stated, because IS is no sovereign state”. Exactly, my dear heroine of war and genocide! You are going to support the bombing of Syria which in fact, as a sovereign nation, has nothing to do with the ISIS you and Merkel and Hollande and Obama and Cameron and ErDOGgan and al-Saud support! This is the very same lady who said that Mr. Assad had “no future in Syria” – showing her truly neocolonial attitude. The German decision to support France in Syria is a blatant violation of international law. It is a declaration of war against the sovereign nation of Syria, which Syria, in return, could legally answer by shooting down the German and French air-terrorists. It is a crime. The federal government of Germany openly proves it is willing to ignore and violate international law – if just the members of the Bundestag approve. The decision of a government of a sovereign nation, which will affect the lives of citizens of another sovereign nation, is no longer a matter of international law but of decisions of the German government. The members of the Bundestag perverted justice and are in compliance with mass-murder. They are in person fully responsible and to be held accountable for all that will follow. Remember: at Nuremberg, the members of the Third Reich’s government got hanged for exactyl the same crimes…. Germany, by this, has made itself a lawless, rough entity. This is the one of the demonic and perverted dimensions of this coup. Kitten vids are prior to preventing more slaughter? And as the world goes on to keep willingly ignorant and silent about the western provocations against Russia (and China) and the obvious violation of the sovereignity of Syria (and Iraq) and the obvious slaughter of the Syrian nation, some terrorists feel encouraged by the Bundestag and the Merkel-regime to act, as we had to witness today, with Turkey invading Syria and Iraq. The refusal to act in accordance with the principles of law and the disrespect for the lives of millions of people has become a key value of the Western terroristic entities, united in NATO and EU. You have to be dull as a dishwater not to realize this. 1. If Germany really intended to fight terrorism, why is Germany still buying oil DAESH stole from Syria? 2. If Germany wants to exterminate terrrorism – why is Germany still supportive to terrorists who kill civilians, such as the cannibals of FSA? 3. If it’s all about “fighting terrroism” – why is German Denfense Minister Mrs. von der Leyen saying that the regime change in Damascus, i.e. the implementation of a terroristic al-Qaeda puppet regime, Libyan style, was an objective of this military engagement? 4. Why does Germany refuse to cooperate with Russia and with the legitimate Syrian government? 5. Why is Germany still arming the terroristic Kurdish Peshmerga militia in Iraq, without authorization by the legitimate Iraqi government – knowing these weapons (radioactive MILAN anti-tank missiles amongst them) will fall in the hands of DAESH, sooner or later? 6. Why is Germany backing the lunatic massmurderer ErDOGan of Turkey as well as the Wahhabi entities of Saudi-Arabia and Qatar in their war against Syria? 7. And why is Germany not just banning DAESH-supporting entities from transferring billions of Dollars to their beloved buddies? Even the dumbest idiot – oops, I meant: well-informed Western European consumers of mainstream-media – might have got it, by now: This war is a war against Syria. This war is not against the German-supported boots on the ground named “Daesh”. “DAESH”, like all the other cannibals, throat-slitters, rapists, thieves, looters, killers, name them FSA, al-Nusra or like you please, is a tool of the Western destabilization plan on the one hand AND an excuse for the very same West to bomb Syria to rubble, on the other hand. Obviously we are witnessing a change in the strategy of the Western and regional anti-Syrian powers. The massive build-up of military power by the USA (deployment of troops inside Syria, including special operation forces, further aid to the US-made “moderates” of Al-Qaeda and DAESH itself), UK parliamentary approval for airstrikes, whilst British SAS-special forces members are fighting in the ranks of DAESH), France /more airstrikes, aircraft carrrier to the Syrian shores) and Germany do all sound like beating the drums of war. Regarding the frontline, this war is very likely capable to devlope to a full-scale war on Syria and even a worldwide war of NATO, EU, regional lackeys on the one side and Syria, Iran, Russia and China on the other side. We all do have the amount of imagination necessary to realize such a war definitely will become a thermo-nuclear war. It’s about ressources and influence, stupid! As you may understand by now, the real reasons for Germany to openly support the anti-Syrian “coalition” and taking the first step into a larger military engagement in Syria (and in Iraq, eventually) are not to fight what Germany istself once helped to create on purpose, but to gain some other goals. Being part of the gang means sharing the swag: If Germany decided to stay aside (militarily), it would not be granted its piece of the cake. The cake, for sure, is Syria. And Germany, like all the other terroristic entities, is hot on grabing the Syrian resources. Putting your hat into the ring means being at the start line for the exploitation that will follow. Helping to kill means stabilizing and securing the free access to resources and slave labour (named “refugees” (in the Western MSM). Helping to destroy means making money with rebuilding. This is a strategy which has been proven profitable for many big companies in the past: create a war, ‘engage’ to solve it, take the winning side, and make money out of it. There will be a funding for reconstruction, financed from national budgets and by international projects. The funny thing is that most companies who will profit from being authorized to build up come from those countries who before had been causing the drestruction (Libyan scenario, Afghanistan, Balcans). 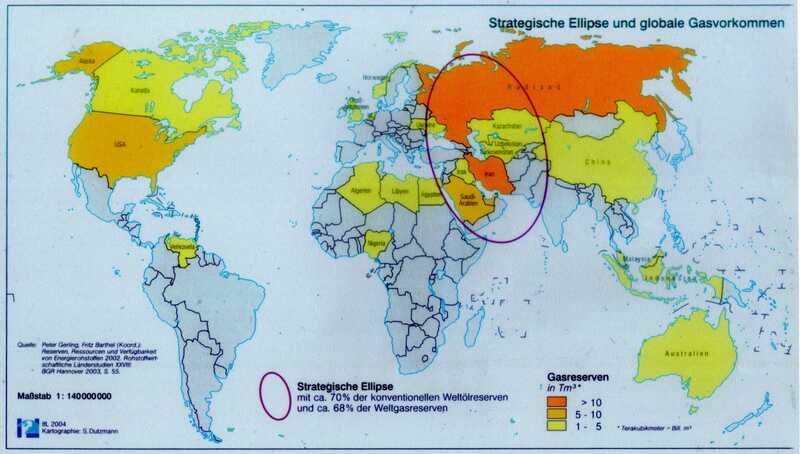 Pushing back Russia and China from the southern end of the “strategical ellipse”, the pivotal area of Western influence and explotitation of natural ressorces, and, by that, preventing Russia and China to further develope their economies. These are just 3 reasons out of a number of reasons and explanations. The majority are about: securing access to exploit resources, others are geostrategy. But all are hostile to human beings, wethere they are in Syria, Afghanistan, Mali, Sudan, Libya, Iraq – or in Europe. It is a vey bad time for being a German patriot. I can not feel any pride for this rotten terroristic and lawless nation anymore, regarding the millions of innocent children, women, men we already have genocided (or helped to genocide) throughout the Middle East, in Africa and in the Balcans. And I am sure, this awful Bundestag-decision on Syria will backfire. It will backfire not only in becoming engaged in a quagmire and eventually having some German NATO-mercenaries killed. It will also backfire in the complete – and planned – destabilization of Gemany, Europe and – maybe – a full scale thermo-nuclear World War with Russia and China. This perspective, however, does not really thrill me. Germany does NOT buy oil from Daesh. Or Turkey. Germany buys from Russia. Oh, really? Germany is buying oil from Russia? Not from DAESH? So tell me: why did Germany (together with others) urgend the EU to lift a ban in Syria for allwing the terrorist to export (meaning: steal and loot) oil from the syrian territories they conquered? It had been Germany pushing the harsh sanctions on Syria, which – like Iran – affect the people and ave very negative impact on the suffering civilians. This wa sin 2011/12, and in 2013 (Februaryy), the EU lifted the sanctions for the one side of anti-syrian terrorists to allow them to steal the oil and sell it to the EU _- whilst the crippling sanctions on the legitimate syrian state, the syrian people, wer not lifted and still do have harsh impacts for the daily life of the syrian people. I am German, and I critizise the criminal actions my nation’s illegal government against Syria, the syrian people. I stand with the syrian people against my government as this governent, brought in power due to faked and illegal elections, is acting in a criminal way and helping to genocide the syrian people. If you decide to stand with terrorists like DAESH or Merkel, I respect your stance. But still, this does not affect the facts. I am not sure wether you are uninformed, misead or just spreading lies. That, with all due respect, may be your choice. BTW: Germany is buying oil from Saudi-Arabia, the main supporter of terrorism in the world and one of the most crrupt and brutal regimes mankind ever had to witness. Western and Europe will be nothing in this world if they are not being robber, killer, invader…etc. Look at the history where Western and Europe countries had been doing those acts. They forgot…life is not about the money but how we make our own path to get the next life after a death. I am moslem and wondering if somebody or group or even a country accuses as moslem followed with robbing…killing…cheating. My God said in Quran even He is prohibiting a very small sin since it will be counted and punished. They just dont believe in God the creator of the whole world…so they dont have any sense of human life. Even in my own goverment…people who play with politic will not be a good man. Thats what i found either in moslem…christian or whatsoever. I am just being happy with all my family though without being a big man or rich. Happiness will just come by sharing what you have and what you can with others. Now…we may better stop talking about them…or it will just a boost of anger and hate. We better manage how to run our own life and how to deal with others without annoying or even hurting. Rockie: as-salamu aleikum. I agree with you in every word you wrote. The west has no chance to keep with its lifestyle other than to constantly attack, occupy and plunder other nation’s wealth. We are parasites. Thank you for your comment. God bless you.